What is the best free IT security software solution? The best free IT security software solution is ManageEngine ADSelfService Plus. It is an online, integrated single sign-on and password management solution that provides domain users with secure, one-click access to all SAML-supported enterprise applications. The Free edition of the software has no expiration and supports all features of its premium Professional edition. Are you looking for an IT security software but don’t have the budget yet to purchase a full-fledged premium solution? Maybe you’re a startup or a small business trying to keep costs to a minimum and are searching for free software to safeguard your devices, network, and systems. While IT security is an area that needs serious attention and investment, you may want at the early stage of your business to initially opt for a zero-cost solution and take the premium route later on. The good news is there are such solutions. 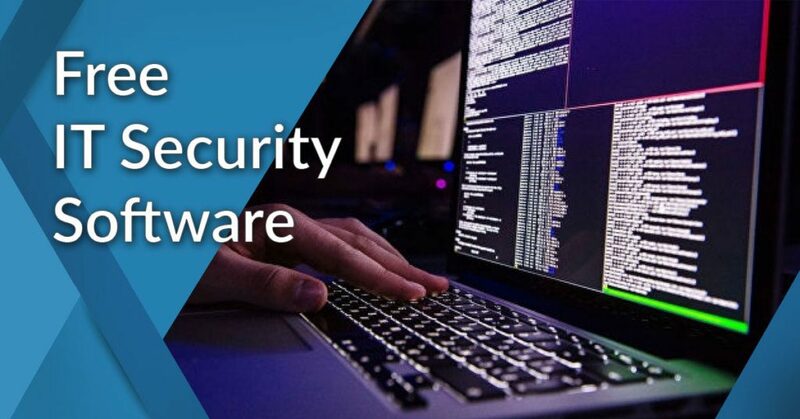 We did the digging so you don’t have to and came up with 12 free IT security software solutions that you can consider. These are mostly free editions of some of the most popular security software tools available in the market. What can you expect from these products that don’t have a price tag? Depending on your business needs, they’ll do the job for light and moderate protection. However, don’t expect an all-in-one solution. IT security software comes in many types – from password managers and network monitors to virus scanners and malware removers. You’ll come across these specialized functions with this list of 12 free IT security software solutions. You can also check our in-depth analysis of security software to learn more. What are the top 12 free IT security software solutions? Did you know that 58% of malware attack victims are small businesses? It was revealed in a 2018 Security Capabilities Benchmark Study that 54% of all cyber attacks resulted in over half a million dollars in financial damages including lost customers, opportunities, and revenues, among others. For SMBs, that amount can end their business for good. Below as polled by Cisco are the top cybersecurity concerns of midmarket businesses. Small businesses have reported that attacks are becoming more sophisticated and severe. Email is the most popular entry point for malware and ransomware but there are many other attack methods being employed such as cracking passwords and hijacking one’s system (after infecting it with malware) and using its resources for mining cryptocurrencies without the victim knowing it. All the above drives home the need for serious security which the products we’ve included below can provide. Do understand that free editions offer limited features and capabilities and often restrict the number of users and devices it can be used on. Safeguarding your data and business systems is of paramount importance that only a robust, full-featured premium solution can provide. Consider freemiums only as the first step in your cybersecurity plan and these 12 free IT security software solutions are the ones that you can try right now. ManageEngine ADSelfService Plus is an online password management solution that helps you do self-service password reset, self -service account unlock, and employee self- update of personal details such as emails, addresses, and telephone numbers. All these can be done directly in Microsoft Windows Active Directory. ADSelfService Plus also gives you secure, one-click access to all SAML-supported enterprise apps including Salesforce, Office 365, and G Suite via Active Directory-based single sign-on (SSO). And for improved security, the software offers Windows two-factor authentication for all local and remote logins. You can test the software yourself. Just sign up for a ManageEngine ADSelfService Plus free trial here. The software is available in two premium editions – Standard and Professional – and a free edition. The great thing about its freemium offering is that it is almost up to par with the features of the two paid packages, limited only by the number of domain users it can support. But overall, the software gives you a full self-service password management solution with tools to secure logons and SSO for custom apps, and rules to enforce security compliance. Cloudflare is a market network security software designed to speed up loading time and protect websites as well as secure APIs, mobile apps, SaaS services, and other Internet properties. Considered as a leading Content Delivery Network (CDN) service, it offers capabilities to reduce the latency of websites and keep web apps always available and accessible. Cloudflare is a popular solution for online publishers, businesses, and SaaS providers, publishers looking to optimize visitor experiences, grow traffic, and increase conversions. It provides cybersecurity tools such as web application firewalls to protect against DDoS attacks, rate limiter to block malicious traffic, and authentication of user access to any web app or domain. Cloudflare offers three paid plans – Pro and Business (monthly subscription) and Enterprise (by quote). These are for websites, blogs, and companies requiring basic, advanced, or enterprise-grade security for their Internet assets. A free edition is available for those wanting to explore Cloudflare. Malwarebytes is a widely used on-premise security solution against malware, ransomware, and other cyber threats. Over 60,000 businesses rely on it for extensive endpoint protection and detection. It is equipped with tools and modules to clean infected devices, block malware, stop ransomware attacks, shield vulnerable systems, manage and monitor endpoints, and provide centralized threat reporting. It also allows you to schedule scans on your computer even if you are not around. In addition, Malwarebytes is able to protect itself from unwanted modifications, prevent files from being locked, and remove viruses in real time. Malwarebytes offers paid plans for personal, business, and enterprise users starting at $39.99 which is good for one year and one device. The paid solutions support Windows, Mac, iOS, and Android operating systems and devices and can be used as a full-featured replacement for your anti-virus software. The free edition of Malwarebytes, however, is intended to complement whatever anti-virus solution you’re using in your Windows computer. Kaspersky Lab is at the forefront in the fight against cybercrime and malware for the past two decades. It is the most tested and most awarded cybersecurity product and well known for its discovery of the most vicious malware and spyware. It boasts of having provided cyber protection to over 400 million users and more than 270,000 organizations worldwide. Kaspersky Lab brings together machine learning, threat intelligence, global network feedback, and human expertise and experience in coming up with products that can effectively predict, detect, and respond to cybersecurity threats. It can provide multi-layered protection for endpoints; security controls for devices, apps, and Internet access; tools against anti-targeted attacks; and capabilities for fraud detection and prevention, among others. Kaspersky Lab has nearly a dozen paid products that cover a wide range of devices, operating systems, on-premise or cloud assets, and for security requirements big or small. Kaspersky Free is its zero-cost anti-virus solution that offers basic protection for your PC. It utilizes proprietary security technologies and real-time data on new threats to help protect your computer. Spiceworks is a completely free, feature-rich solution that combines three important functions in one package – IT help desk, device inventory, and network monitoring. It is designed to help IT professionals, network engineers, and system administrators monitor their network system (servers, switches, SNMP devices, etc) and get real-time updates. Users get to keep tab of network health and performance and get alerted for any issues and signs of trouble. Other features and capabilities provided by Spiceworks include IP security tools, IP scanner, and IP lookup, website down checker, run inventory of network devices, Internet outage heats, map, traceroute for checking connections, SSL checker, remote support, and port scanner and tester. All these and more are offered by Spiceworks at zero cost. Bitdefender is an award-winning cybersecurity solution for commercial and personal use. It is equipped with comprehensive features to protect computers and mobile devices in homes, small businesses, and enterprises from digital threats such as viruses, ransomware, and privacy invasion. Among its many capabilities are advanced threat detection and defense, anti-phishing and anti-fraud, webcam protection, files protection and files shredder, and secure online banking and shopping. It also offers privacy firewalls, safe social network browsing, file shredder, quick risk checker, and password manager. These features are bundled in several product offerings with different pricing. Bitdefender’s Free Edition is quick to install and doesn’t consume much of your computer’s resources. It is light but blazing fast, giving you real-time threat detection, a powerful scan engine, and removal of all types of malware. AVG AntiVirus is a top-rated antivirus software built to protect personal computer, smartphones and Internet devices against malware, viruses, ransomware, adware, rootkits, trojans, and other similar threats. It is a security solution designed to safeguard your privacy, files, data, emails networks, and computing devices from cyber attacks and threats. The software gives you tools to protect your online identity, prevent theft, shred files, secure servers, shield emails, lock devices, backup applications, and scan links. In addition, it has capabilities to tune up PCs, boost computer speed, and manage devices remotely. You get all these features with a fully packed, all-around solution for $79.99/year. The AVG AntiVirus Free Edition is one of the most robust freemiums around, giving you a light but capable tool with real-time security updates, scanning for both malware and computer performance issues, and instant blocking of malicious downloads before they reach your PC. Avast is a multi-awarded antivirus software that offers what is considered by many as one of the best endpoint protection currently in the market. It is able to safeguard and shield Mac and Windows systems, iOS and Android devices as well as servers and networks. It can be deployed locally on local machines or accessed online with a web-based console that gives you complete control over the antivirus installed on your endpoint devices. Among its key features aside from its smart anti-virus and anti-spam are browser cleanup, intelligent scan, sandbox, password management, secure DNS, SafeZone browser, data shredder, and automatic software updater. Avast is available in over a dozen premium plans but also has several free security and optimization tools for Mac, iOS, and Android devices. It offers a very capable free version of the software for Windows that can detect and block viruses in real-time using smart analytics, and a behavior shield that keeps an eye on your applications for signs of malware. Dashlane is a cloud-hosted password management platform that lets you efficiently organize passwords and store them in a secure, centralized location. Since it’s an online solution, your passwords can be easily accessed anytime and anywhere you need them. It comes with an autosave tool that automatically types your passwords for you the next time you log in. Passwords are protected with AES-256 encryption which keeps your data virtually hack-proof. This makes Dashline an ideal solution for data security professionals needing enterprise-grade password management platform that will keep their password-protected sites and data safe unauthorized access, hacks, and leaks. Dashlane offers two paid packages – a per-user licensing plan that starts $2/user per month and an enterprise licensing plan with custom pricing. Its free edition gives you password storage for up to 50 accounts, two-factor authentication as well as a password generator, password changer, and password sharing tools. However, it can only be used on one device. LastPass is an online cloud-based password manager tool that specializes in remembering and storing all your passwords, so you don’t have to. It can be used for personal and business purposes and is a solution for protecting and managing your passwords. It gives you a single master password to access and secure the vault which stores all your passwords and account information for all the devices, websites, and platforms you use. LastPass is able to keep your data and details for logins, addresses, credit card, and Wi-Fi access which can be synced with all your devices. Access to your LastPass vault is secured with two-factor authentication, mobile pin app unlock or fingerprint login. The software is available in four affordable monthly subscription plans – Premium, Families, Teams, and Enterprise. These include features such as unlimited shared folders, basic and advanced reporting, 1GB file storage, and security policies. Its free edition provides you a customizable storage vault, access on all devices, multi-factor authentication to keep your account secure. EventLog Analyzer from ManageEngine keeps in a centralized repository a log of data generated by devices, applications, and network systems. The software encrypts the log data to make sure it is secured for compliance audits and forensic analysis. And to maintain integrity, the archived data is time-stamped and hashed to ensure that logs have not been tampered with. The event log analyzer software is able to monitor file integrity, conduct log analysis, and track privileged users. It can smartly scan your data logs and automatically generate reports on historical trends and user activity, among others. With EventLog Analyzer, you are guaranteed that your data is regularly updated and completely protected from both external and internal threats. There are only two editions offered – Free and Premium. Probe.ly is a web vulnerability scanning solution intended for security teams, developers, and SaaS businesses looking to safeguard their applications 24/7 from potential vulnerabilities. It offers continuous scanning capability and informs you as soon as it detects threats. You get to easily fix any detected anomaly since the solution comes with tailored instructions to guide you in resolving issues. On top of that, these guides are available in the language your developers use for streamlined problem resolution. With enhanced vulnerability identification, you’ll be able to keep your web apps safe and reduce instances of false positives, providing you with smoother workflows and saving you time from critical tasks. Probe.ly is offered in three paid plans – Starter, Pro, and Premium – starting at €49.00/target/month (target refers to a specific web application or site). Its free edition gives you configuration tools, scheduled scans, whitelisting, and basic website authentication. Is Freemium Enough for Your Needs? It depends on your security requirements. If you need just a good password manager, the free password solutions we included here will be up to the task. If you need a solution that is light on your computer’s resources and provides basic protection for your connected device, then there are many free anti-virus tools in the list above that will do the job. However, as you grow your business and accumulate vital information and data every day, and as you undertake transactions and payments online, you’ll find that freemiums are quite limiting and wanting. You’ll have to pay the price with more robust cyber and IT security. You can refer to our analysis of security software solutions to learn more of the pricing plans of leading vendors. It’s a worthy investment to secure your business the alternative of which – being vulnerable and easily hacked and breached – is definitely more costly. For the meantime, any of the products we listed here will serve your simple, light, and specific security needs.